Ollie’s Weekly Ad Sale valid April 19 – April 25, 2019. This Week Ollie’s Bargain Outlet Flyer sale hot deals: K-Cup Brewing Premium Single Serve Coffee; Bella 5qt Programmable Slow Cooker; Rowenta Steaming; Two Slice Toaster; Simply Green Multi-Purpose Cleaner, Glass Cleaner; Paula Deen 10″ Skillet Nonstick; Samsonite Collapsible, Flip-Top Storage Box; Bissell Essential Deep Cleaner; Bissell Spotbot Hands Free Cleaner; Simple Green Trigger Spray Carpet Cleaner; Luxurious Reversible Mink Throws; Play-Doh Design A Dress Boutique; Essential Three Stooges DVD Collection; Sauder 3 Shelf Bookcase; Pergo Laminate Flooring; LA’s Totally Awesome Liquid Detergent; Bialetti Saute Bialetti Pan Set; Gildan Athletic Tee Shirts; and more. 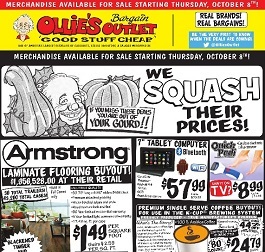 Find all deals and offers, in the latest Ollie’s Bargain Outlet Weekly Sale Ad.